Electronics kits. Benton Harbor, Mich. 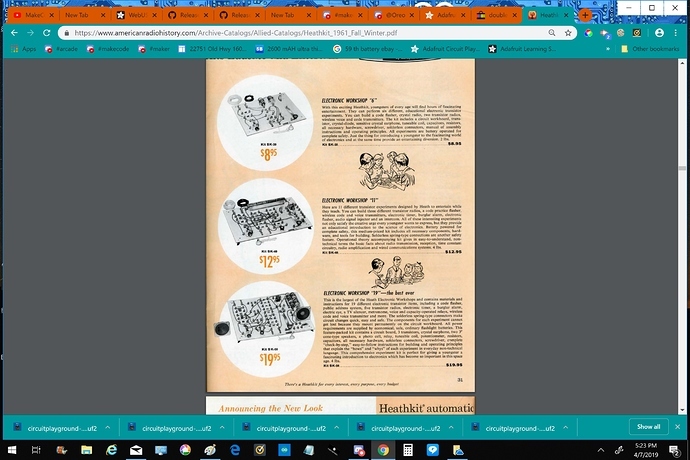 I found a 1950 Heathkit CR-1, crystal radio (most people have no idea what that is nowadays) including head phones on Ebay and sent it to my uncle in Birmingham, MI . He’s 96 yr old. Crystal set does not work, earphones do. He’ll get it working and be the oldest ham radio operator in North America working on a Michigan-made electronics project this spring (2019) . That set is featured in the 1961 Heathkit catalog. He gets the last laugh ! CR-1 cost me over $100 to buy and ship: priceless. My dad bought me one of those one transistor radio sets back in the early 1960’s for Christmas, he wasn’t that impressed when I had one of the transistor leads broken off by the first night playing with it…Years later I bought a Heathkit 26" Color TV kit for $1,000 or something like that, late 1980’s, it was quite a project, had a dozen or so plug in circuit boards that you had to solder…just left it without a cabinet, looked like a robot project lol!